Turkey Parme Biscotti is mum's secret weapon against me, because there is nothing I wouldn't do for it!!! Mum asked: Do you want it? I answered a definite: OF COURSE!! Mum shot me with her hand: BANG! I lifted my head: Where's my treat?? Mum shot me again: BANG! I slammed my head back down: ok I'm dead, can I have the treat now? I can even do a long "Sit-Stay", followed by a "COME"!! Now this is the part that I don't understand. It seems like everytime when mum is about to give me something yummy, she always has to ask me "give it to crow-crow??" Does she actually think that there will be a day when the answer is YES??? "Crow-crow" is my word for crows. I learned what "crow-crow" meant a long time ago since they are always around, trying to steal my food!! So everytime I hear the words "crow-crow", I get really mad and I go and chase them off. Mum asked: Should we give it to "crow-crow"? Mum didn't get the point and asked again: Give it to "crow-crows"? Is this a magic treat or what?? I thought some of you might be intersted in trying the TPB, so I have gotten mum's permission to share the recipe of her secret weapon with you!! In a blender, blend turkey and eggs until as smooth as possible. Pour into a large mixing bowl, add in the rest of the ingredients and mix well. Spread batter on a cookie sheet (well greased with vegetable oil) or in a 9 X 12 pan about 1/3 inch in thickness. Bake at 350 F until no longer wet looking inside. Approximately 45 minutes for one pan (varies from oven to oven). Cut into small pieces after it's been cooled. Keep refrigerated or in the freezer. i have to agree with chiyo about your "play dead" trick. i could never do that. mom has been trying to get me to "hand" for ages and i still not sure what she's talking about. you should get your mom to record all the tricks you know and share with us! but please warn us in advance so that we don't let our mom sees it, otherwise we'll make to work harder to get treats! this weekend project: must get mom to buy an oven to bake cookies! I can sit, shake, down and roll over. I do more tricks but I never told my you-mans cuz I don't want to do them. My mom is SO impressed by your tricks and how well you follow your mom's suggestions. She was cracking up at the play dead trick. I do not perform any tricks myself. Acting isn't my forte. My mom is worried because I can't even "sit" or "stay" very well. She wants to sign me up for acting classes soon. You made Mama laugh so hard she almost pee peed her pants, woof woof!! You are so cute doing your tricks! Mama taught Snickers how to sit, lay, rollover, but Snickers doesn't really like the rollover part. We need to have her teach us the bang trick. That one is neat. Do you know the Monster Bird trick? Actually Mama doesn't even have to say it if we hear those pesky Kingfisher birds near the pond. I Butchy go berserk and bark and scare them away from Mama's koi fish. Thanks for the treat recipe, Mama said she'll make some of those for us, yum yum!!! Sunny girl! You are so smart and talented! I just know I will see you in the movies some day. that recipe couldn't come at a better time- my Human got her new stove delievered today. I am printing this recipe out and putting it on the stove in hopes she bakes me some of these yummmy treats. I bet it would be good made with liverworst, too. Thanks for sharing. I dont like crows too. You should always chase them away in case they intercept your treats. Thanks for letting us all in on that recipe! Bandit (he's the Lab that lives with me) has a couple of allergies, and anything The Mom can do to give him a treat or two is a cool thing. 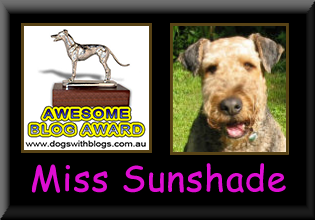 Sunshade, you are one cool pup! We don't really do tricks - well, we DO, but they aren't the kinds a biped would ask us to do ... if ya know what we mean. We will "sit" and "down" (except Dave won't "down"), us girls will "give 5", Zim will "give 4" (he doesn't have his dew claws), and Dave ... won't. But, hey, he's Mom's Guide Dog for the Color Blind, and that's gotta be worth something! Tail wags from all of us! Those are some awsome tricks you have going on there!!! I'm most impress with the "bang" trick. I have to hide that clip from MaMa just in case she makes me practise. Oh, & the recipe, fantastic. The only problem is; my MaMa doesn't bake! & yes, my dew claw is gone. So, hi-four again to those cool tricks. Mama makes me do all kinds of silly tricks too. I admit that I would probably do anything for a treat. I am picky though. Mama once baked all kinds of dog treats for me from scratch and I just turned my nose up at them. tag you back!!! it's new, with a twist! come and see! PS: asked mom about pang mei and she brought me in front of a mirror. maybe it means pretty girl? we're pretty girls! Wow! I am impressed to say the least! Momma has never even attempted to teach me any tricks being that I'm a dachshund and all it would just be a waste of time. The "Bang you're dead" is the bestest trick ever! Momma copied the recipe down and is gonna make some of those for me this weekend. Thanks for sharing Sunny! P.S. I wanted you to know that I've added you under my Friends Links if that's O.K. We don't have crow-crows here but we have birdies! I hate it when birdies try to steal my food and I love to chase them. Anyhow, gots to dash!